Pimentos are widely known for their appearance in the middle of green olives. As a child, the stuffed green and red condiment was on my list of preferred foods. I also had no problem with pimentos in other foods like tuna and chicken casseroles, vegetable and rice dishes and omelets, to name a few. Actually, I always loved the happy color pimentos imparted to the plate of food. The only thing I have not liked about pimentos is the price. 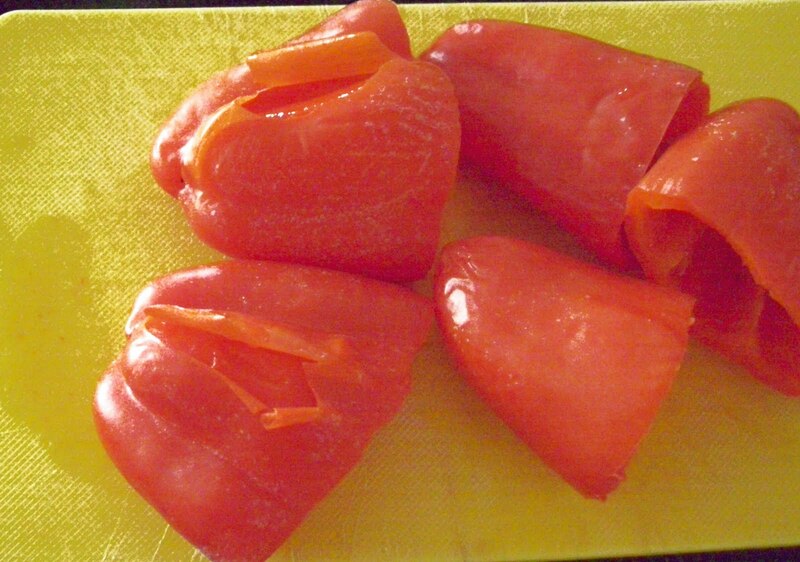 True pimentos are made from a a heart-shaped, cherry pepper. The flesh of the true pimento is sweet, succulent and more aromatic than that of the red bell pepper. On the other hand, a reasonable facsimile can be obtained from a red, bell pepper - it is easy to make mock pimentos and very inexpensive. I make mock-pimentos when red peppers are on sale and usually have small bags of red strips waiting in my freezer. I can be lavish with my use of them and do not have to worry about the cost. Step 1 - Select one or more large, red peppers. Remove the stem end and clean out the seeds and any white fiber from the inside. 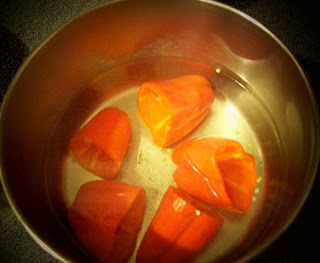 Step 2 - Heat a large pot of water to a simmer and immerse the cleaned peppers. Step 3 - Simmer until the skin starts to crack and pulls away from the sides of the pepper. Remove peppers from water, drain and cool. 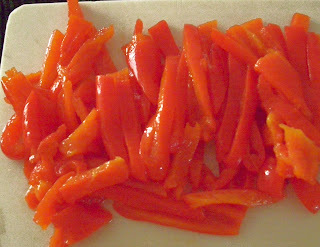 Step 4 - When peppers are cool enough to handle, carefully peel all the skin away from the outside of each pepper. It may be necessary to use a sharp knife to help with this process. Step 5 - Cut the skinless flesh into desired-sized strips. Use immediately or freeze in a single layer; seal the frozen strips for later use.